After creating my Alice and Queen of Hearts dolls, I decided to continue on with the Alice in wonderland theme. Cheshire cat is one of my favorite characters and since I just finished working on a faun inspired doll, I decided to experiment more with the idea of humans with animal features. I loved sculpting the hooves on my previous faun doll so I knew I definitely wanted to give this one little cat feet with tiny sharp claws. So far, I think she is one of my favorites that I have created. I have plans to eventually create more Alice themed dolls. Someone recently suggested the Mad Hatter and Tweedle Dee and Tweedle dum. I also have an idea for a caterpillar girl that I really hope to do soon. For more of my works please visit my art page. 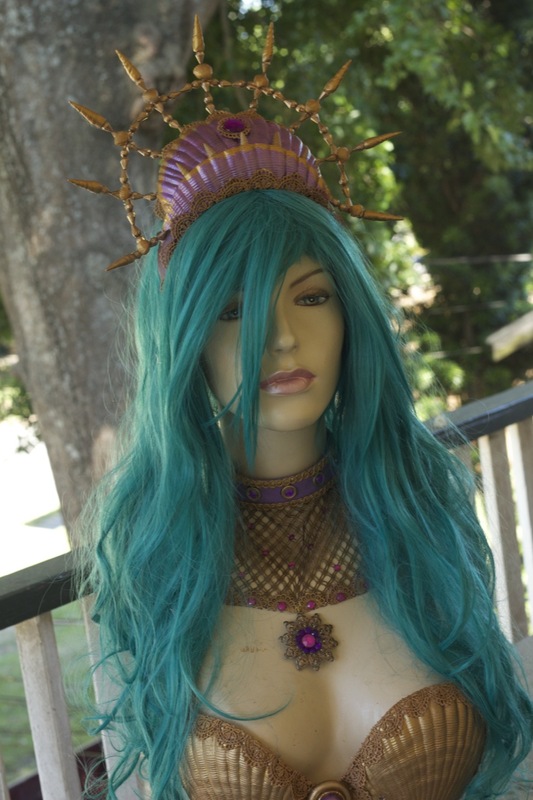 My costume for Texas Renaissance Festival 1001 Dreams weekend. Everything was made by me and is my original design/concept. For more of my costumes/dolls/artwork please visit my art page. You can also find my work here. I am working on some new chokers to sell at an upcoming steampunk festival in November. Until then I will be listing them in my Etsy shop. They are all OOAK, handmade chokers with double interfacing for extra strength. They have grommets in the back so they can corset to fit a variety of neck sizes. Feel free to follow my Facebook art page for more updates. One month until A-kon so I have been focusing a lot of my time trying to get my two costumes completed. I am very proud of myself for not waiting until the last minute like I often do. Yes, I admit I am highly guilty of being a last minute person. Sometimes I tend to work better under the pressure however for these two costumes I knew there would be a lot of hand painting involved and didn’t want to stress myself out like I usually do. I am also excited that so far I have hardly bought a thing for these costumes. My goal for them was to improvise using things I already had on hand so I wouldn’t have to make a lot of trips to the fabric shop like I normally do. Not to mention that right now money is a bit tight and me and my boyfriend share a car so I wanted to make this process as stress free as possible. Anyway I am just excited about my progress and that I have a little less than a month left and I am very close to being done. Don’t get me wrong, I still have a lot more to do, mainly on the mermaid but I will NOT be working in the hotel room like I do every year. I am refusing to let that happen. My goal is to have this done a week before the con (something that in all of my years of cosplaying has not happened yet)….seriously. I literally always have something that I am working on in the hotel room. So here are the costumes I am working on. Both are designs from the artist Sakizou, and I have done my own interpretations of them. I love all of Sakizou’s designs and their are a large handful of them that I would love to recreate but for some reason this Geisha image really stood out to me. My only regret is that I didn’t use a deeper red for the costume but like I said earlier, this was the only red I had available so I am working with what I have here. I have almost everything complete on this one minus a few details here and there, the other arm piece (which I am dreading b/c I hate making duplicates of things), some more details on the headpiece (such as the chopsticks and some more hanging beads) and figuring out what I want to do with the lower half of the body (shoes, stockings?). I need to order a red umbrella and was contemplating painting some designs to compliment the costume (if I have the time) and also need to purchase some white powder, eye makeup and some red lipstick. Very excited about the face makeup. 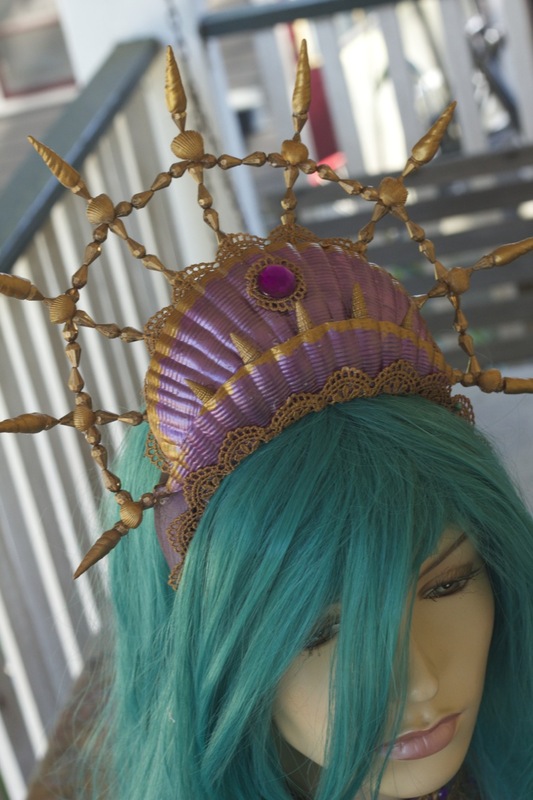 All the details were hand painted and the wig was also designed by me. 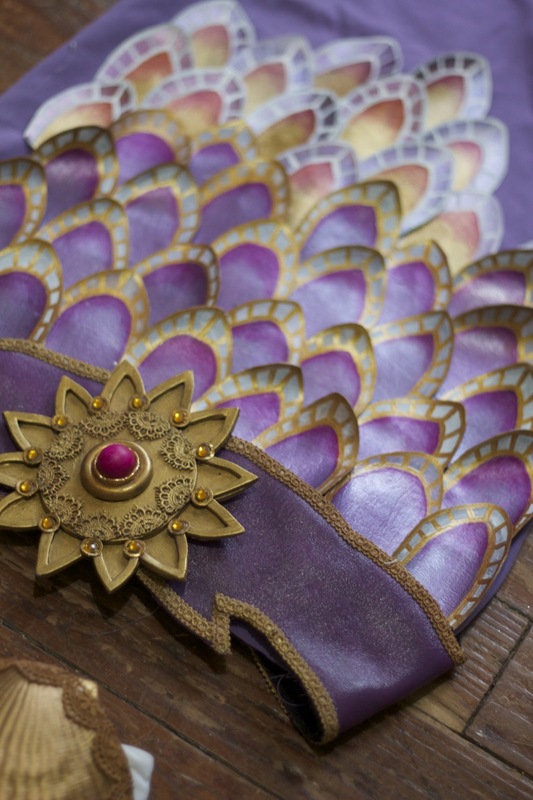 My second costume is a mermaid and yes I guess that is going to be odd having a walking mermaid however I just loved this design and the colors so much that I really wanted to do it. 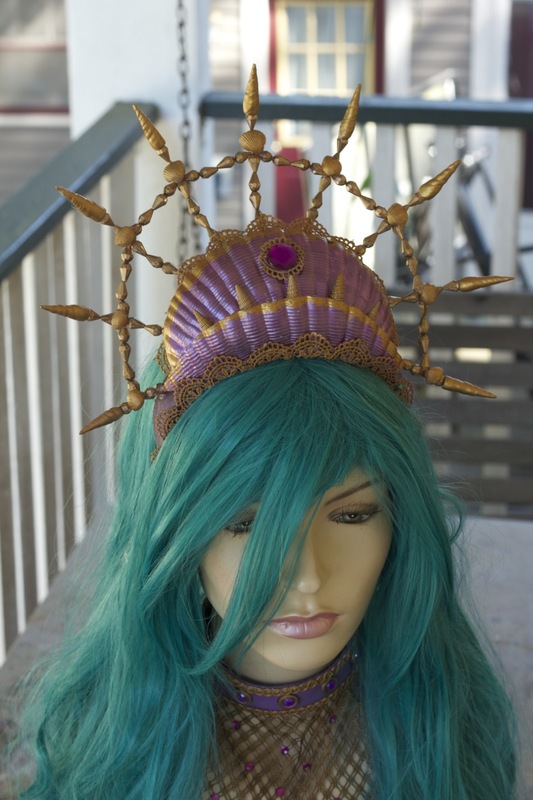 I have changed the colors up a bit and simplified the headpiece and wig. All the scales are hand cut and painted and taking FOREVER! So far their are over a 100 and I still have a lot more space to fill. The repetition is starting to kill me however I hope it is worth it in the end. This is not a good choice for an impatient gemini but I have to finish the job. I still have a bit more to do on this one but luckily I have the majority of the Geisha out the way so I can focus on this one. Doll making will continue when I return from the convention so be ready…I have some new ideas developing. My newest art doll is now for sale in my Etsy shop.